Visit Frederick (The Tourism Council of Frederick County, Inc.) is a public-private partnership dedicated to enhancing the economic benefit of tourism for Frederick County&apos;s businesses, attractions, local governments, and residents. Membership is open to businesses and individuals interested in promoting tourism in Frederick County. Visit Frederick is the sole owner of the information collected on VisitFrederick.org. Visit Frederick collects information from our users at several different points on our website. On this website we collect demographic data from Google&apos;s Interest-based advertising with Google Analytics. Visit Frederick uses third-party advertising technology to serve ads on sites upon which we advertise. This technology uses information about your visits to the sites upon which we advertise (not including your name, address, or other personal information) to serve our ads to you. In the course of serving our advertisements to you, a unique third-party cookie may be placed or recognized on your browser. In addition, we use clear GIFs, or pixel tags, provided by our ad serving company to help manage our online advertising. These clear GIFs allow our ad server to recognize a browser&apos;s cookie when a browser visits this site and to learn which banner ads bring users to our website. The information we collect and share through this technology is not personally identifiable. While on the Visit Frederick website you may voluntarily choose to be added to Visit Frederick email lists. 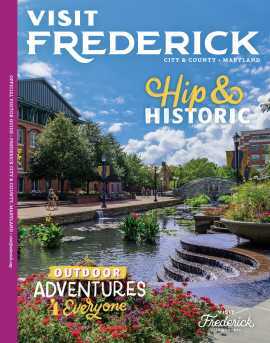 When you choose that option, Visit Frederick places you on lists to receive information about Visit Frederick through email newsletters with information of general interest to individuals who live in or visit Frederick County, Maryland. Email newsletters are sent out on a monthly basis. Each email communication always contains instructions on how to discontinue receipt. This website takes every precaution to protect our users&apos; information. When users submit sensitive information via the website, their information is protected both online and off-line. The servers that store personally identifiable information are in a secure environment, in a locked facility. Further, only authorized staff members have access to specific areas of consumer information. This website contains links to other sites. Please be aware that we, Visit Frederick, are not responsible for the privacy practices of such other sites. We encourage our users to be aware that when they leave our site, they are encouraged to read the privacy statements of each and every website that collects personally identifiable information. This privacy statement applies solely to information collected by the website listed above. Visit Frederick creates original content for this site. Images used on the Visit Frederick site are either original or used by special permission of the photographers. Use of the content and/or images, either edited or as-is, is permitted, but requires permission from Visit Frederick. Visit Frederick reserves the right to disallow the use of content by any party at any time and without explanation or cause. For permission to use content or images, contact the administrator at mmuntz@fredco-md.net.